Reinforced concrete staircases are structurally designed as cantilevered, slab type or beam-slab type. Within this study an irregular cantilevered staircase is studied and its structural dynamic characteristics are explored. An eigen-value modal analysis is performed to determine the mode shapes, their corresponding modal participation factors and natural periods of vibration. The highest modes of interest are identified. Following on that, a scaled record of a previous historical earthquake was applied within a direct integration time-history analysis in order to assess the performance of that irregular stair case under earthquake loading. That load was applied within two perpendicular load cases representing the different possible directions of earthquake vibrations in which the effect of the structure irregularity was assessed per direction. The structure was found to have large drifts creating a need to change the structural system. The coastal city of Hurghada at the entrance of the southern Suez Gulf of the Red Sea was founded in the early 20th century, and until a few years ago it was a small fishing village. But since the 1980s, it has been continually enlarged by Egyptian and foreign investors to become the leading coastal resort on the Red Sea. Throughout the most recent decade, the population in Hurghada city expanded quickly as a consequence of expanding of financial action identified with tourism. Most of the structures there were not initially designed to resist earthquakes; thusly, generally little occasions later on can be source of socio-economic disasters. The Egyptian Red Sea city constitutes a major tourism destination, especially for diving, and the coral reefs (Hilmi et al. 2012). Situated at 27.23°N and 33.82°E, Hurghada is known to be in the range of high seismic zone in Egypt (Housing and Building National Research Center 2008). The high rate of seismic movement there is mostly related to the modification in movement at the triple intersection between the African plate, the Arabian plate, and the Sinai micro plate. This zone has been known as a range of significant moderate extent seismic action. It has different sources of earthquakes occur at the northern Red Sea and its two branches Gulf of Suez and Gulf of Aqaba (Hamouda 2011). The latest maximum earthquake magnitude (Local Magnitude ML = 6.8) was experienced on March 31, 1969. It was situated at 20 km (NE direction) from Hurghada city (Hamouda 2011). The demand for a new National museum that reflects the beauty of the nature of that region has been increasing hence a design was proposed by the late architect Ahmed Mito that involved several challenges from construction and structural perspectives. The present study attempts to estimate the dynamic response for a three-storey irregular staircase within the Hurghada National Museum project as shown in Figs. 1 and 2. 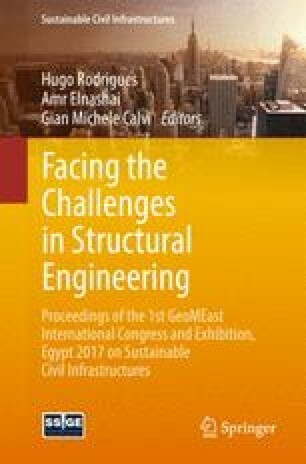 The fact that the stair is irregular creates a challenge as it creates a necessity to analyze it dynamically when evaluating its performance under earthquake loads (Tedesco et al. 1999); (Housing and Building National Research Center 2008). The three dimensional finite element model of the staircase. The irregular three-storey reinforced concrete staircase is supported on three columns and a bearing wall. The staircase was modeled on the finite element software SAP2000 Computers and Structures Inc. (2016) using thin shell elements for the staircase slabs and landings as well as frame elements for the staircase supporting beams and columns. Shell elements were meshed with maximum size of 0.25 m with a total number of 7491. The total number of frame elements was 31. Shell and frame elements were connected using 8041 nodes. The concrete had a characteristic strength of 35 MPa. The staircase was modeled to behave as cantilever staircase supported only on the beams and the wall by removing the connectivity between the shell elements at the intersections between adjacent slabs as shown in Fig. 1. This choice of maximum size of shell elements was meant to increase the accuracy of the analysis and to model the most realistic behavior. Moreover, the boundary conditions at each of the upper floor levels are set to restraint the motion in the horizontal plane to represent the lateral support that the museum slabs and beams provides to the staircase while the vertical motion was allowed at all the floors except for the foundation level which was considered to be a hinged support. In order for the structure to be dynamically analyzed in an accurate manner, a modal analysis was performed in order to determine the modes of vibration of the staircase and the corresponding natural period of each as shown in Table 1. These periods are extremely important in determining the time step size within the time-history analysis and expecting which modes will resonate due to the earthquake loads. The results of the modal analysis shown in Table 1 are ordered in a descending order with the first mode corresponding to the largest natural period of 0.47 s and a modal participation factor of 6.2% as a translation in the x direction and 37.9% as a translation in the y direction. On the other hand, modes 2, 3, 4 and 5 have periods that range from 0.22 s to 0.31 s and modal participation factors reaching up to 21.7% while modes 6 to 12 had modal participation factors that are less than 2% and periods of 0.2 s or less. Hence, the fifth mode is considered to be the highest mode of interest when dynamically analyzing this structure. Also it could be noticed that none of the modes had a modal participation factor in any of the two horizontal axis that was exactly zero which is attributed to the irregularity of the structure that caused the center of rigidity to be deviated from the center of mass which excites a twisting component in most of the modes hence most of them have significant components in both x and y directions. The first five modes have natural periods that are near to the dominant periods of earthquake excitations that are typically within the order of 0.5 s to 2 s (Tedesco et al. 1999). That means that these first five modes are the ones expected to resonate with the earthquake load especially that these modes are the ones with the highest modal participation factors in the horizontal plane which is the main direction of action of earthquake loads. It could be also noticed that none of the first twelve modes had a vertical modal participation factor exceeding 6% which means that there could be a mode that is acting mainly in the vertical direction that is higher than the twelfth mode. However, the effect of such uncaptured mode would be minor as the main component of earthquake vibrations is horizontal and the twelfth mode has a period of 0.14 s and any higher mode would have a lower period which would be significantly less than the dominant earthquake periods. Hence, it is not expected to see a significant response due to vertical modes when dynamically analyzing such a structure under earthquake loads. A non-linear dynamic analysis was performed taking into consideration p-delta and large deformations into account in order to investigate the dynamic behavior of this irregular staircase under specific earthquake loading conditions. The earthquake record chosen to act as the seismic load was the 1940 El Centro earthquake that happened in California, USA with perceived intensity of X on the Mercalli intensity scale (Wikimedia Foundation, Inc. 2016). The earthquake signal was scaled to match the peak ground acceleration of Hurghada that was found to be 0.29 g (Hamouda 2011). The irregularity of the structure lead to the necessity of investigating two different seismic cases as it is difficult to determine which direction is the major direction and which is the minor direction. The first seismic case was set so that the dominant acceleration loading direction is to be in the x direction while the other seismic load case was set so that the dominant acceleration loading direction is to be in the y direction. Modifiers for the moment for the moment of inertia were used as per Egyptian Code of Practice (Housing and Building National Research Center 2007) to be 0.7 for the columns, 0.5 for beams, 0.35 for walls and 0.25 for slabs. The Newmark direct integration method used in the analysis applies the concept of proportional damping in which the coefficients α and β are multiplied by the stiffness and mass matrices. These two coefficients were calculated based on a conservatively assumed damping of 0.05 as specified by (Farghaly 2013) and (Bicanic et al. 2014). Another factor taken into account is the time step size as according to (Bathe 2006) the solution will not converge if the time step exceeds T/π and it could only produce accurate results if it is less than or equal to T/10 where T is the smaller of the natural period of the highest mode of interest and the dominant period of loading. Hence, the time step size was set to 0.02 s that could accurately capture responses from the first six modes with a number of steps that was set to 500. In each seismic load case points of highest absolute displacement were studied. In the first load case two points with highest absolute displacement in x and y directions respectively were examined. The first point was found to be Joint 1047 with highest absolute displacement in x direction. Absolute displacement versus time was plotted as shown in Fig. 3 and also the response spectrum curve in x direction was plotted as shown in Fig. 4. From the response spectrum, several peaks could be noticed at periods ranging between 0.21 s and 0.5 s corresponding to resonance occurring due to a combination of the first five modes. The second point in the first case was found to be Joint 5440 with highest absolute displacement in y direction. Absolute displacement vs time was plotted as in Fig. 5 and also the response spectrum curve in y direction was plotted as in Fig. 6. From the response spectrum the peak point significantly occurs at a period of 0.5 s and from the modal analysis it can be expected that this peak would represent an excitation of mode 1. The trends of the vibrations in the x and y directions shown in Figs. 3 and 5 are similar however the amplitude of vibrations in the x direction are significantly larger than the amplitude of vibrations in the y direction as the main direction of loading is the x direction for this case while the trend is the same because both directions are dynamically excited by modes of vibrations with natural periods that are within the same order. In the second load case two points were also examined. The first point was found to be Joint 1047 with highest absolute displacement in x direction. Absolute displacement versus time was plotted as in Fig. 7 and also the response spectrum curve in x direction was plotted as in Fig. 8. Similar to what was experienced in the first load case, and from examining the response spectrum, several peaks could be noticed at periods ranging between 0.21 s and 0.5 s corresponding to resonance occurring due to a combination of the first five modes. The second point in the second case was found to be Joint 479 with highest absolute displacement in y direction. Absolute displacement vs time was plotted as in Fig. 9 and also the response spectrum curve in y direction was plotted as in Fig. 10. From the response spectrum the peak period is 0.5 s and from the modal analysis it can be expected that this point would was excited at mode 1. The trends of the vibrations in the x and y directions shown in Figs. 7 and 9 are similar however the amplitude of vibrations in the y direction are significantly larger than the amplitude of vibrations in the x direction as the main direction of loading is the y direction for this case while the trend is the same because both directions are dynamically excited by modes of vibrations with natural periods that are within the same order. Comparing the three curves of time versus displacement presented in each of Figs. 3, 5, 7 and 9 the displacements in the z direction were always less in magnitude than those in the other two directions and was obviously with lower variation due to the fact that no resonance occurs in the vertical direction as all the vertical modal participation factors were low in value while the load is mainly acting in the horizontal direction. Another common factor in these curves is that the trend of vibrations within the two horizontal axes were very similar due to the modes exciting these vibrations having components in both the x and y directions while the major direction of loading is the factor governing which of these two components will have a higher value. On the other hand, comparing the response spectra presented in Figs. 4, 6, 8 and 10 would lead to noticing that for all of these spectra the major component of the response was the resonant component whether due to one mode or due to a participation from several modes. This could be seen from the comparing the areas beneath the resonant components of the vibrations (at periods equal or near to the natural periods) to the areas beneath the background and quasi-static components of vibrations (at periods significantly larger than the natural periods). The areas beneath the resonant peaks were significantly larger than the remaining areas representing a higher contribution to the resonant component of vibration when compared to the background and quasi-static components. However, it could be noticed that the maximum lateral drift under any of the load cases and within any of the horizontal directions were all within the order of 0.28 m. Knowing that the floor height is 4.8 m, and the total height is consequently is 14.4 m and this value of drift is approximately 1/51 of the total height. This relative displacement is quite high and is attributed to the large irregularity, the high twisting effect and the large resonance that occurs due to the earthquake signal. Hence, it is highly recommended that the structural system should be changed in order to have lower periods and larger lateral stiffness. The natural periods for the twelve modes of vibrations studied ranged between 0.14 s and 0.471 s which overlap with the dominant periods of earthquakes. The first five modes of vibrations are the principle modes of vibration with the fifth mode being the highest mode of interest. Due to the irregularity of the structure, most of the modes had twisting components. Displacements in the vertical direction were always less in magnitude than the displacements in the horizontal plane. Due to high twisting components in various modes, the horizontal deflections in directions perpendicular to the earthquake loads had the similar trends as the deflections parallel to the loads although with less amplitudes. The resonant component of vibration is of higher contribution when compared to the background and quasi-static components confirming the high need of a dynamic analysis for that structure. The relative displacement is high due to the large irregularity, the high twisting effect and the large resonance that occurs due to the earthquake signal. It is highly recommended that the structural system should be changed in order to have lower periods and larger lateral stiffness.